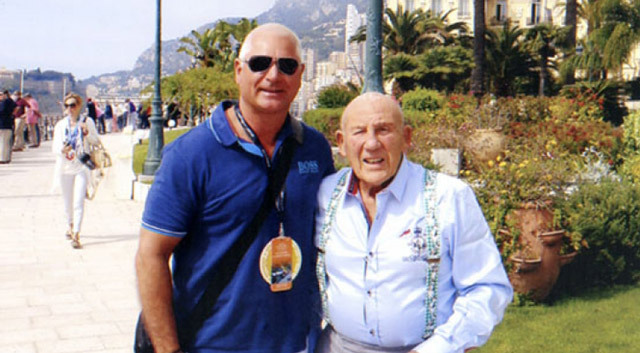 EWN’s Sales Director Steven Euesden was delighted to attend this year’s Historic Monaco Grand Prix – and indescribably proud to meet F1 legend Sir Stirling Moss. The Historic Monaco Grand Prix, which has taken place since 1997, is staged two weeks before the F1 Grand Prix in Monaco. The Automobile Club of Monaco (ACM) organised event takes place every two years on the same challenging circuit as the F1 GP race but there’s one major difference – rather than top-of-the-range high-tech cars the race is made up of vintage models. The race is tailored to give spectators and participants the opportunity to experience the motorsport event as it would have been at its April 14 1929 inception. This year the 9th Grand Prix de Monaco Historique was held on May 9-11 on the famous 3.34km Monaco Grand Prix circuit. The Monte Carlo race, together with the Mediterranean sea and sun, classic cars and F1 legends, is always certain to be an unmissable extravaganza. Races, which took place on May 11 after two days of qualifying, were 10-12 laps each, taking around 30-35 minutes. Series A: Pre-war “Voiturettes” and Grand-Prix Cars, from 1939 maximum. Series A: GB’s Matthew Grist in a 1934 Alfa Romeo TIPO B (P3), with a lap time of 1:59.058. Series B: GB’s Roger Wills, driving a 1959 Cooper T51 (Climax) with a best lap time of 1:56.001. Series C: GB’s Alex Buncombe, driving a 1952 Jaguar C Type, with a best lap time of 1:59.920. Series D: GB’s Andy Middlehurst, driving a 1962 Lotus 25 (Climax), with a fastest lap of 1:53.641. Series E: Japan’s Katsuaki Kubota. He was driving a 1971 Lotus 72, and had a fastest lap time of 1:35.980. Series F: GB’s Michael Lyons, driving a 1977 Hesketh 308E and clocking his fastest lap at 1:33.904. Series G: Italy’s Paolo Barilla, driving a 1976 Chevron B34 (Toyota), with a fastest lap of 1:40.900. This year there was a new feature to the race in the form of the Credit Suisse Historic Racing Forum. Former drivers like Sir Stirling Moss and Romain Dumas met up for series of talks and photo sessions and discussed topics like ‘dream circuits’. On meeting his racing hero, Steven said: “He was an absolute dream to meet. Such a charming man. It was so surreal to meet my idol – I still can’t quite believe I’ve met Stirling Moss. As evidenced by the winners list, Britain did fantastically well in this year’s race, scooping many of the first place trophies. The 10th Historic Monaco Grand Prix is set to take place in May 2016.